To protect the security of your organisation, you need ID cards that can be relied upon. Every card printed on the SC4500’s tried and tested platform can be secured with a HoloKote® anti-fraud watermark. Batch print with the interchangeable 100-card feeder or print one-offs or rewritable cards with the hand-feed card slot at the front. The USB interface, Ethernet and Microsoft certified, Mac OS X compatible, plug and play driver make it easy to install and easy to use. 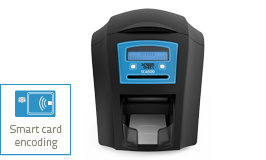 Magnetic stripe encoding is available for the SC4500 as an extended option for extra electronic security. 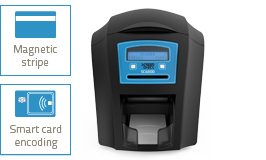 Smart card in-line encoding is available for the SC4500 as an extended option for extra electronic security. The combination of magnetic stripe and smart card in-line encoding is available for extra complete electronic security. Available off-the-shelf as single or double-sided, you can also upgrade a single-sided SC4500 to enable duplex printing with a unique drop-in field enhancement. 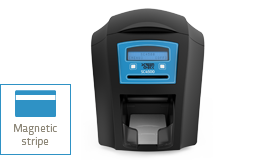 The SC4500 is a single-sided printer which can be easily field upgraded to double-sided by means of a simple drop-in upgrade. The SC4500 Duo is pre-configured as a doublesided printer. The user has the option to print a HoloKote® security watermark across the card surface. When used with HoloPatch® cards, one area of the HoloKote watermark is highlighted as a high visibility security seal. A choice of 4 fixed HoloKote patterns are selectable from the printer driver. 453mm L x 206mm W x 233mm H (17.8” L x 8.1” W x 9.2” H) including hopper and stacker. Sheltered office environment 10°C to 30°C (50°F to 85°F). >125 cards per hour for colour and 7 seconds per card for monochrome.